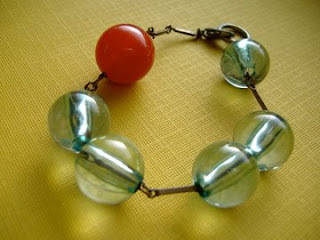 Finding inspiration for new pattern, texture and color combinations is a constant quest for the jewelry designer. 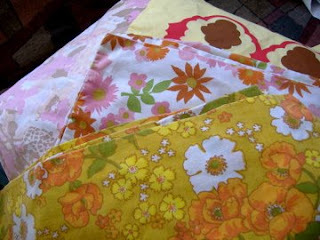 When I'm at a loss, I turn to my collection of vintage 1960s textiles for a refresher on the 'classics'! I love how warm and cool shades are unabashedly tossed together like with the tomato and lemon or rust and moss of these favorite pillow cases that inspired my new Mint Metals Bracelet. The bold, architectural shapes with delicate, feminine flourishes brought me to combine the most delicate, vintage chain I have with giant cobalt blue amorphous lucite beads. Tap into the past to re-design the future!